Electric Cars stories at Techdirt. stories filed under: "electric cars"
In the lead up to Hurricane Irma hitting Florida over the weekend, Tesla did something kind of interesting: it gave a "free" upgrade to a bunch of Tesla drivers in Florida, extending the range of those vehicles, to make it easier for them to evacuate the state. Now, as an initial response, this may seem praiseworthy. The company did something (at no cost to car-owners) to help them evacuate from a serious danger zone. In a complete vacuum, that sounds like a good idea. But there are a variety of problems with it when put back into context. The first thing you need to understand is that while Tesla sells different version of its Model S, with different ranges, the range is actually entirely software-dependent. That is, it uses the same batteries in different cars -- it just limits how much they'll charge via software. Thus, spend more on a "nicer" model and more of the battery is used. So all that happened here was that Tesla "upgraded" these cars with an over the air update. In some ways, this feels kind of neat -- it means that a Tesla owner could "purchase" an upgrade to extend the range of the car. But it should also be somewhat terrifying. In some areas, this has lead to discussions about the possibility of hacking the software on the cheaper version to unlock the greater battery power -- and I, for one, can't wait to see the CFAA lawsuit that eventually comes out of that should it ever happen (at least some people are hacking into the Tesla's battery management system, but just to determine how much capacity is really available). "oops sorry we bricked all the Teslas in the vicinity of the hurricane. Please accept our condolences and a year of free credit monitoring"
So, yes, without any context, merely upgrading the cars' range sure sounds like a good thing. But when you begin to think about it in the context of who actually owns the car you bought, it gets a lot scarier. In December 2015, employees at Faraday’s headquarters in Gardena, California, received a mandate from Jia: Design a prototype LeEco car that could be shown off publicly at a spring event in Beijing. According to several former employees, some of Faraday’s designers were pulled off of their core projects to work on the vehicle. And in April 2016, LeEco unveiled a sleek, electric sedan called LeSee. On stage, Jia, who has been outspoken about his plans to usurp Tesla, touted LeSee as a LeEco creation as the white sedan glided across the stage to park in a mock garage. The audience couldn’t see that the seemingly self-driving car was in fact being piloted from backstage via remote control. In addition, these sources revealed to The Verge that the company’s intellectual property is not owned by FF, but by a separate entity named FF Cayman Global, a revelation which raises questions about Faraday Future’s relationship with its investors and suppliers, and could further endanger the company’s success. "Some of the reasons some of us left was because we were afraid that all of the work that’s being done in the US, there is no proper corporate structure or legal entity structure," the employee told Business Insider. "The feeling we had was that the IP [intellectual property] was not protected and if and when Faraday goes under, these guys would just pick up all the IP and all these other people in the US would be out of a job." That's all interesting... but what's amazing is that in all of these discussions about how Faraday Future "doesn't own its intellectual property" absolutely no one seems to point out the fact that the company that everyone compares it to, Tesla, famously dumped all its patents into the public domain and told anyone to go ahead and use them. That seems like a relevant point to make in articles about this upstart competitor and its "intellectual property." Of course, it's possible that the articles could mean something else when it says "intellectual property" -- such as trademarks -- but it seems unlikely that the trademarks for a flailing company that is unlikely to ever get anything on the market are that valuable. The whole story, and the ignoring of Tesla's stance on patents... is just strange. It is true that sometimes failing companies hang onto their patents as a sort of last ditch effort to extract some return for their investors in a patent fire sale. But if you've reached that point, things have already gone way too far south to really matter. Tesla has shown that it can build a pretty damn successful company without relying on "intellectual property." It seems that people should stop freaking out that Faraday Future may have dumped its patents into some offshore company, and focus on the company's real problems -- like the fact that its execs are racing out the door as fast as possible. We're on the verge of a transportation revolution with autonomous cars and electric vehicles about to become mainstream means of mobility. Various concept cars make the future of transportation look more bubble-shaped or like spandex, so the roads are really going to look a bit crazy if we allow 40-year-old muscle cars to drive along with surviving K-cars and futuristic-looking Tron-like hypercars. Check out a few more crazy cars that aren't quite practical in the links below. The classic yellow taxi cab isn't manufactured any longer, but a company that still makes parts for these iconic vehicles has a couple of funky-looking prototype vehicles based on its cabs. The A888 limo is basically a stretched out 6-door, 12-passenger version of a yellow cab, and the "Sport Pick-up Crossover" is a yellow cab in front and Chevy El Camino-style pickup in the back. Maybe you've heard of cars that run on compressed air -- well, those cars aren't exactly efficient. Surprise!? One study says compressed air cars score worse than electric vehicles on energy use, greenhouse gas emissions, and life-cycle costs -- but that maybe a hybrid electric and compressed air car might be more practical somehow? Cars have changed a lot over the past hundred years, and sometimes new cars don't quite look so great. It'd be nice to see some classic cars get modern technology in them, but it ain't simple or inexpensive. Check out a few of these classic cars that might get a modern makeover. DailyDirt: Horsepower? Why Are We Measuring Anything With Horse-Based Units? Last year, we wrote about two key "corruption indicators" in city and state governments: they ban direct sales models to block Tesla from competing with traditional car companies and they ban Uber/Lyft style car hailing services to protect local taxi incumbents. It appears that Texas is really trying to wave its anti-innovation flag as strongly as possible as the legislature down there failed to move forward on two key bills that would have made it possible for Tesla to do direct sales in Texas... and to stop local cities from blocking Uber & Lyft to favor taxi incumbents. A Texas House deadline has come and gone, killing many top-priority bills for both parties — among them one that would allow Tesla-backed direct car sales and another to regulate ride-hailing companies. Midnight Thursday was the last chance for House bills to win initial, full-chamber approval. Since any proposal can be tacked onto other bills as amendments, no measure is completely dead until the legislative session ends June 1. But even with such resurrections, actually becoming state law now gets far tougher. And, of course, this comes just after the FTC warned Michigan for its blocking of direct sales of cars like Tesla. Rep. Senfronia Thompson — one of the House's most senior members currently serving her 20th term — said it was the company's own fault that the bill didn't pass. "I can appreciate Tesla wanting to sell cars, but I think it would have been wiser if Mr. Tesla had sat down with the car dealers first," she said. Really? In what world is it considered appropriate to force an innovative company that wants to go direct to consumers to first "sit down" with the gatekeepers that are trying to block them? "I can appreciate Amazon wanting to sell books to people, but I think it would have been wiser if Mr. Amazon had sat down with retail store builders first." "I can appreciate YouTube wanting to let anyone upload videos, but I think it would have been wiser if Mr. YouTube had sat down with TV producers first." That's not how innovation works. At all. And thus, we can cross Texas off the list of innovative states. The law around car hailing is not quite as big of a deal, but without the new Texas law, various cities within Texas can still create their own rules that would effectively make it impossible for such services to operate there. There are states that create spaces for innovation -- and then there are those that protect incumbents. Texas appears to be making it clear that it's the latter. If I were a startup in Austin, I might consider finding somewhere else to operate. Of Course Tesla Wasn't Just Being Altruistic In Opening Up Its Patents: That's The Whole Point! We, like many in the media, already wrote up the story about Elon Musk's announcement that Tesla was opening up all of Tesla's patents, promising not to bring any lawsuits against anyone who uses them in good faith. The "good faith" caveat has resulted in some head scratching and reasonable questions -- and we hope that Musk clarifies this position with a clearer explanation. Some have pointed out that with such vague language, it may really be more of an invitation to negotiate a licensing deal, rather than truly opening up the patents (though, I'd imagine anyone looking to challenge that has lawyers boning up on promissory estoppel). However, I wanted to address one of the "criticisms" that seemed to come out repeatedly about this move: that it wasn't a big deal because it's "not altruistic." That line was used over and over and over again in the press, almost always suggesting that people shouldn't be celebrating this move. LA Times: "Even if other competitors copy Tesla’s design, Tesla still gets to sell them batteries, and that’s pretty awesome. Tesla’s decision isn’t entirely altruistic." Seeking Alpha: "The general thinking is that somehow this move is altruistic for the benefit of the EV industry or that this has something to do with parallels like Mac OS X, Wikipedia, and crowdfunding. We disagree. This is simply a strategic move to rapidly expand and monetize the EV market. This move is hard-core strategy and really has nothing to do with altruism." NASDAQ: Elon Musk and Tesla: Altruistic or Ulterior Motive? Forbes: "Of course, Musk may have an ulterior motive in addition to his altruistic one." South China Morning Post: "Tesla’s apparent altruism with its patents is just smart business"
ValueWalk: "Tesla Motors Inc's open source approach is far from altruistic." Harvard Business Review: "In sum, Elon Musk’s opening up of Tesla’s patent portfolio might be motivated as much by strategic necessity rather than by altruism." Market News Call: "Musk may not be successful running two industrial firms like online social media or cloud-focused firms, but he’s also not making decisions entirely out of altruism; he’s just using a non-traditional approach to creating value for his shareholders." Engineering.com: "I think he [Nikola Tesla] would approve of Tesla Motors’ decision to open its technology to the world, even if the motivation was more business than altruism." I recognize why everyone feels the need to do this -- especially those sites that claim to be focused on "investors," but it's also somewhat frustrating. Perhaps it's just because we've been writing about this issue for well over a decade, but of course this move is being done because it's good for business: but that's the point. We've become so stupidly brainwashed into believing that locking up and protecting everything is good for business that people seem positively shocked when a company does something that shows that's simply not true. Everyone feels the need to explain what a "crazy" idea it is that not hoarding information to yourself might actually be good for business. And the worst may be in that first link up there, in which analyst giant Gartner completely destroys what little credibility it may have had when one of its analysts, Thilo Koslowski, pans the decision: "If you open up all your books to everyone, it means you all are fighting a war with the same weapons." Talk about someone admitting their own ignorance of how business and innovation actually works. Opening up your patents hardly means fighting a war with all the same weapons. Everyone still gets to innovate, and many of those innovations are not in the patents themselves. "You want to be innovating so fast that you invalidate your prior patents, in terms of what really matters. It’s the velocity of innovation that matters." This is a point that we've been trying to make for years: innovation is an ongoing process, and what matters most is not the single burst of inspiration, but the pace of that process -- which Musk more eloquently calls "the velocity of innovation." Patents on pieces of that ongoing process act as friction or toll booths in that process, slowing it down. Truly innovative companies know that they're going to keep innovating, and others copying what they're doing is the least of their worries. Of course this move is about innovation and business and will be good for Tesla. But it's depressing that so many people automatically think that needs to be explained. We live in a dangerous world for innovation when a concept as simple as this seems so foreign to so many people. Even the fact that the idea that "doing good" and "building a good business" seem to be contradictory terms is troubling. Whether or not Musk is personally "altruistic" is beyond the point. Increasing the velocity of innovation for electric vehicles can be both good for Tesla and for the world, and that shouldn't be such a crazy idea. Earlier this week, we wrote about rumors that Elon Musk was going to free up some of Tesla's patents to encourage more people to adopt the company's Supercharger system. As we noted this shouldn't be controversial, but it was still considered as such. Elon Musk has now made the official announcement and it actually goes way beyond what was originally rumored. It's not just about the Superchargers, it's all of Tesla's patents. But, better than that, Musk explains why he no longer thinks patents make sense and even demolishes the one argument that even many patent skeptics make: that they're "still needed to stop big companies from copying your innovations." As we've explained in the past big companies almost never recognize truly disruptive innovation when it happens. This is for a variety of reasons, including the basic innovator's dilemma, but also just because companies are so focused on their own things, it's tough to get them to realize outside innovation. Furthermore, even when they do copy, it's actually pretty rare for them to get it right. That's because, from the outside, they only copy the superficial stuff, and have no idea why something is really successful. And thus, even if they have the "exact plans" for the competitor's technology or process, they don't understand the little things that make customers love them. Similarly, innovators are constantly innovating, so by the time the copycat catches up, they're still behind. But, an even bigger issue, as we explained before, is that having more viable competitors can also enlarge the overall market. So if a company like Tesla has no viable competitors, they're left educating the market and building all the infrastructure themselves -- and that's pure cost. Opening up their patents actually helps Tesla in the long run by (hopefully) spreading out some of those costs, and increasing the size of the overall market. This is what many patent system supporters just don't get -- but Musk clearly understands deeply. He talks about how he used to be a patent system believer, but he's been converted in the other direction. And while he avoided patents at some of his companies, with Tesla he was convinced they were necessary, because "the big car companies" might just copy everything he's done. Now, he says, he knows that's not true, and he actually would prefer they do copy Tesla's work. At Tesla, however, we felt compelled to create patents out of concern that the big car companies would copy our technology and then use their massive manufacturing, sales and marketing power to overwhelm Tesla. We couldn’t have been more wrong. The unfortunate reality is the opposite: electric car programs (or programs for any vehicle that doesn’t burn hydrocarbons) at the major manufacturers are small to non-existent, constituting an average of far less than 1% of their total vehicle sales. At best, the large automakers are producing electric cars with limited range in limited volume. Some produce no zero emission cars at all. Given that annual new vehicle production is approaching 100 million per year and the global fleet is approximately 2 billion cars, it is impossible for Tesla to build electric cars fast enough to address the carbon crisis. By the same token, it means the market is enormous. Our true competition is not the small trickle of non-Tesla electric cars being produced, but rather the enormous flood of gasoline cars pouring out of the world’s factories every day. We believe that Tesla, other companies making electric cars, and the world would all benefit from a common, rapidly-evolving technology platform. This is absolutely true and it's great to see it stated so directly. If only other companies were willing to do so. As for the actual way this will work, Tesla has announced that it "will not initiate patent lawsuits against anyone who, in good faith, wants to use our technology." That's not entirely putting the work into the public domain, but it's a good step. Years ago, I had hopes that Google and others would do something similar, but it has not come to pass. Google had made a similar pledge, but only for open source projects, and Twitter has basically given its own engineers the ability to veto any offensive patent litigation efforts by issuing their own license. But Tesla has now gone even further than both of them by basically telling any competitor to feel free to make use of its patents without worrying about getting sued. Unlike so many other companies and company leaders, Musk appears to recognize the simple fact that innovation is not in how many patents you get, it's in how you actually build amazing products and services that people want -- and patents can often get in the way of that, rather than help it. It's nice to see him declare that so directly. 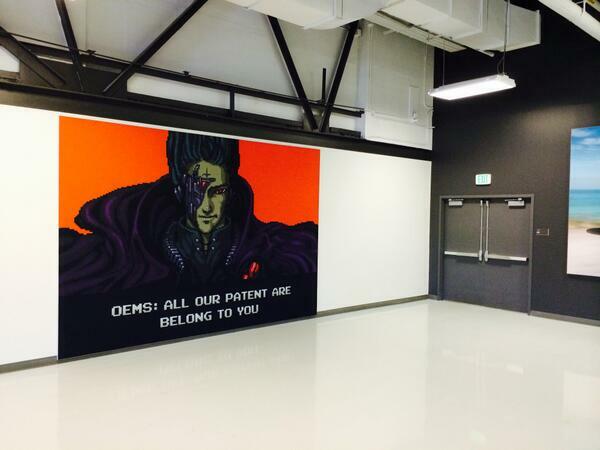 He even took the symbolic gesture of removing the framed patents from Tesla's lobby wall. This is great to see and hopefully it will inspire others in the tech industry to put down similar stakes as well. While the details aren't entirely clear yet, there are reports that the company is likely to "open up" or "give away" some of its patents on its Supercharger system in an effort to create a standard that other electric car makers can use. Elon Musk has been hinting at doing something "fairly controversial" with the company's patents for a little while now. The really tragic thing is that this should not be controversial. Anyone who's studied the history of innovation knows how badly patents get in the way of standardization. There often is long and involved fights over how patents fit into standards, with debates about fees and "RAND" pricing. Fights break out over whose patents get included, and then giant bureaucracies spring up around who gets to manage various patent pools, and how money gets distributed. And all of it slows down the actual innovation process. And this is a problem. Hopefully, the rumors are accurate, and Tesla really is freeing up its patents, because Musk has always been a more visionary sort. He must realize that the business is selling the cars, and any advance that makes the cars themselves more useful makes them more valuable, and widespread infrastructure that helps his cars and which he doesn't have to pay for is only a good thing in the long run. For too long, the "typical" business wisdom from those who are too focused on permission-driven innovation is that you have to lock up everything. But toll booths create friction and slow down the opportunities for real innovation. It would be great to see Musk do "something controversial" like this, even if it's ridiculously depressing that this idea is considered even remotely controversial. Monetizing each step of the process, even if it limits the overall market is what should be seen as controversial -- rather than sharing knowledge and encouraging others to build upon a shared standard that increases opportunities for the entire market. Another day, another story of stupid protectionist regulations getting in the way of anyone trying to be innovative. This time, it's about Tesla, the well known electric car company based out here in California. Apparently, various states have set up ridiculous protectionist laws that say it's illegal for automakers to sell cars directly to consumers in retail settings. The various car dealer lobbyists who pushed to get those laws passed are now complaining that Tesla and its high end "stores" violate that law -- despite the fact that you can't actually buy a Tesla car in a Tesla store. In order to stay on the correct side of these idiotic laws, you can go into the stores and learn all about the Tesla... but if you want to buy, you have to go online and put money down via Tesla's website. The dealers are arguing that "anything that gets you to the executed contract is part of the sale," but that's ridiculous. A magazine ad. A TV commercial. Plenty of other things can "get you to the executed contract" and are perfectly reasonable. What's really going on here is that states have passed these protectionist laws to help out independent dealerships who worried that car companies might decide to cut out one of the more annoying middlemen in the world and go direct to consumers. So they passed these laws which serve no purpose, whatsoever, other than to encourage greater annoyance and overhead for car buyers. Just the fact that you can't actually buy a Tesla at a store should highlight how silly this -- but the fact that these dealers are still complaining and arguing that the company violates the law shows just how petty they can be.